Digital painting tutorial desert empire concept art. This tutorial show you how to paint a desert scene with some characters in it. 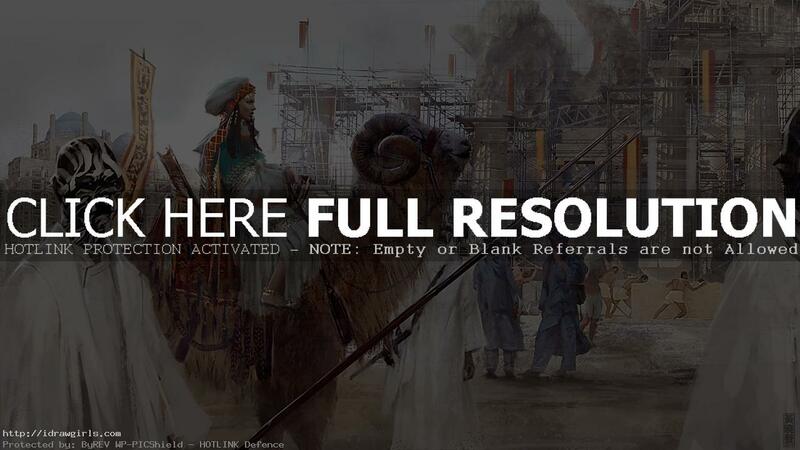 This is a concept art scene of a princess and her bannermen entering a city of desert empire. It was inspired by some ancient Persian empire. You can scroll down further to see step by step images with instruction. I hope you enjoy this digital painting tutorial desert empire. First I am looking for a good reference to create a color palette or color scheme for my concept art. I am looking for something that have look and feel of a camel riding in desert. I spend about 30 minutes to finish up the composition. This is a concept speedpainting of a princess and soldiers. The speedpainting is a quick concept art. It supposed to be quick just to give you overall visual communication. Usually I will pick one good one out of three to five speedpaints. And spend more hours to polish it up. All of my finished concept art comes from humble speedpainting. They are very rough like sketches. Eventually I will add more additional thought and idea into the image. This one I am thinking of epic fantasy of a palace construction backdrop that has a lot of laborers or perhaps ancient slaves. Then I also change the camel into some desert creature design and make a princess a bit older. In this tutorial, I also use open sky lighting the scene and a bit of back lighting. I first painting these figures with just shapes. Silhouettes are one of the most important element in any concept art. Shapes are really important in painting. If you can get these big bold shapes correct, you are more than halfway done. As long as you shape contains realistic essence of the subject, it can look very realistic. With dramatic lighting will help elevate your painting to another level without much effort.